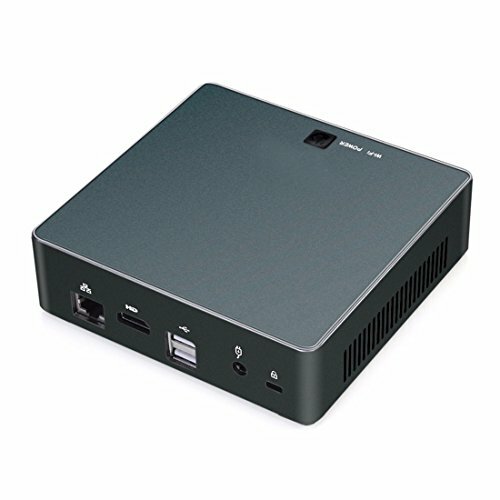 Ultra compact PC design at only 0.6L (39 x 124 x 129mm). Supports 2.5" HDD/SSD, 7.0/9.5 mm thick (1 x 6 Gbps SATA 3). Dual display with HDMI+USB-C(Buy adapter of USB-C to HDMI/DP). VESA mounting Bracket (75 x 75mm + 100 x 100mm). Office, skype, yahoo, outlook and all other office requirement support and runs perfectly. Support OS:Windows 10 Pro pre-installed; WIN8.1 64bit, Ubuntu Optional. AC 100-240V Output: DC 19V 2.1A. Mini PC, HDMI Cable, VESA, Power Cable, US Power Adapter, Screws.